When I created this blog I told myself I’d restrict it to just reviewing merchandise but now it’s my one year anniversary (3 days late, my apologies) I can’t help but reflect on how far things have come over that time. For as long as I can remember I have always wanted my own website. I’m pretty nifty with HTML and Photoshop but I never really got the right thing to write about. I tried to make both gaming sites and a site for the comics/doodles from scratch but neither took off and both ended up being more work than fun so I gave up. I don’t even know what made me make a WordPress blog and start writing about my FF merch but it just happened one day at university on the 17th May 2011. Perhaps I was putting off revision for exams! It took me a couple of hours to get used to, but within the evening I had this site up and running looking just as it is now (I haven’t changed a thing!). I would like to thank Bryan Veloso for this wonderful template theme I am using – I got this from the WordPress templates page. Apparently it’s one of the most popular and I can see why. I added my own Amano artwork of Zidane and Garnet and it now looks like my very own professional blog (in my view anyway!). I will never forget my first commenter (is that a word? ): Silvercube. It boosts someone’s confidence to have a comment or like on their posts so this was a really nice thing for me so early on. My page views are still fairly low daily but it is easy to keep going because this is something I enjoy. I have a real passion for FF merch so I feel like views are more of a bonus. 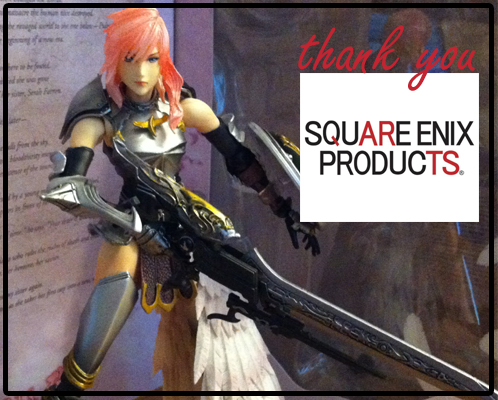 I would also like to extend my thanks to Square Enix Products Facebook Page whom shared my blog on 26th April 2012, netting me 2646 views on that day (easily the record for my daily views). I know I don’t always write nice things about your products -cough-Tiduspendant-cough- but the majority of your merch is ace! I am always honest about your items and I’ll certainly be buying and reviewing more merch from your store in future. Now I’ve talked about setting up the blog I just want to reflect on how I started collected FF merch and where I am with it today. I have always been the collecting type of person. It started with TY beanie babies and then progressed to Nintendo and The Legend of Zelda. This never really worked out for me due to the lack of any quality items (statues and figures have always been a soft spot for me and Nintendo just doesn’t cut it for this). Being very passionate about FF, it made sense when I brought some cheap Play Arts off of Play.com. From there I went on to buy some jewellery from the Square Enix store and things just went crazy from there! I started off very slow and only picked up the cheap items but I had no real aim. I just wanted it all so long as it was within my budget. Things got very out of hand when XIII launched. Not only was I so hyped up for several months beforehand the game succeeded all my expectations (hence the bucket loads of XIII displayed on this site). It was at this point in time where collecting started to become more of an obsession. Despite my hefty amount of merch I still felt like I was an amateur in regard to what I had. The older statues which I really wanted were so expensive and yet what I did own didn’t really feel like enough. I would see other people’s collections online and it would get me down because I just didn’t understand how I could ever get close to what they had. It has taken me a long time but I’ve finally realised it doesn’t matter how much merch you own so long as you enjoy yourself. Take a tip from me if you’re ever going to get into collecting FF merch – have an aim. There is so much available; you can live without some of it! I wish I had been more regimented in my buying rather than buying anything and everything. Right now I have given myself the goal of two things: completing my Play Arts collection and FFVIII Kotobukiya character/GF statues. I have literally only just learnt all of this after my most recent spending spree so my golden words of wisdom are this – less is more. Come chat to me and other like-minded people at the Final Fantasy Merchandise Forum if you want to get more information about collecting or leave a comment and I’ll get back to you. Nice post! Really interesting to read about how your passion for collecting and Final Fantasy developed, and great to see that you’ve found such a great way to share both. Aww thank you, that was very touching! I was in Canada and I’m back now. I try and visit your blog when I can. Hope your summer is going well. I’m looking forward to Theatrhythm (sp?) on 3DS soon! Happy belated anniversary! I’m sure your blog will grow! I’ve had mine for almost 5 years now. I love my blog but I haven’t done much blogging lately! Wow! I bet it was amazing in Canada! I’ve always wanted to visit there! I’m looking forward to Theatrhythm as well. I do love Nobuo’s tunes so I am sure it won’t disappoint! And I know what you mean about blogging, it’s easy to let real life take over.